This vehicle was introduced to the market in 2003. The coupe version was discontinued in 2009 with the roadster sticking around for an additional year. The Nissan 350Z is sporty, yet compact. It has two seats and a powerful engine with rear wheel drive. It is known for having excellent handling and an affordable price. In the first few years of production there was a 287 horsepower V6 under the hood. In subsequent year the horsepower was upgraded to 300 horsepower. Then, in 2007, this was changed to 306 horsepower. The engine was paired with either a 6 speed manual or a 5 speed automatic transmission. 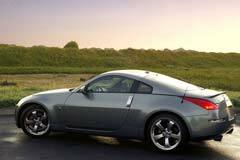 When purchasing a used Nissan 350Z it would be in your best interest to consider a later model year due to the gradual improvement in its hardware and features over time. This is not a family vehicle, but rather a car that is made to be fun to drive. 2008 350Z NISMO 6 SPEED 50K CAR 1477 2008 Nissan 350Z, Nogaro Red with 50,827 Miles available now!